This acoustic album is layered in superb guitar playing, beautiful harmonies, mulitple percussion / drum grooves and excellent vocals providing a variety of musical moods. After graduating from G.I.T. 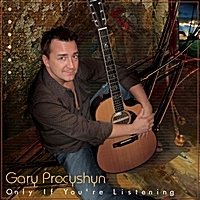 in Los Angeles Gary has found the true Artsist in himself as a Singer Songwriter / Guitar player. This 1st solo release showcased his incredible vocals and unique harmony style. The guitar playing is outstanding and unique avoiding the tradional while being varied and tasteful. The lead off track Like A Stone won Honorable mentions in the Billboard World Song Contest as well as The International Songwriting Competition in London , England. Gary's talents won praise from Chris Burke-Gaffney (CBG Artist Development, Songwriter and Manager who helped Chantal Kreviazuk's career start rolling) and Nashville song plugger Sherril Blackman. The incredibly original acoustic version of U2's huge single I Will Follow is a guitar players delight and an awsome listen for anyone who is a fan of Singer Songwriter unplugged covers. Ripe is an ambiant love song written for the loss and recapture of Gary's passion for music. Sorry is loaded with attitude from a bad break up and the guitar playing is proof of why Gary won a Scholarship for Guitar to G.I.T. The album covers allot of ground with real true heartfelt emotion from realtionships come and gone. A listen to the title track Only If You're Listening and you will feel the pain of lost love. Sarcastic humor is captured in Wither. The last track My Song is a terrific homage to Gary's life, the ineviatable end we all face one day and the celebration of it we should enjoy while here at the last farewell.